It’s a hot day and there isn’t a breath of cooling wind among the ruins of the Hot Wells bath house. Weeds grow to the top of the charred windows, framed by brick walls left scarred by wind, rain and graffiti. A broken concrete walkway looks down into the pools of the old bath house, dry now and littered with leaves and wild flowers. A faded sign painted across one wall warns that high diving is strictly prohibited. The springs are long capped off, the bad-egg smell of sulphur-laden water the only hint of the mineral springs that gave the resort its name. A blue heron pauses atop the broken stone wall before gliding away toward the San Antonio River. Turn a corner and it doesn’t take much imagination to hear the tinny melody of a foxtrot begin or the crystalline chatter of elegantly dressed men and women long dead. The bath house and the nearby Hot Wells Hotel were once the premier destination for the wealthy seeking to feel the restorative powers of the waters amid luxurious surroundings. Rudolph Valentino came here, as did Theodore Roosevelt. If San Antonio developer James Lifshutz has his way, Hot Wells will live again. Only the ruins of bathhouse remain. The hotel, which sat only yards away is long gone, destroyed by fire. A sprawl of trees and overgrown brush and the crumbling remains of old tourist cabins from the 1940s mark the spot. Lifshutz’ hopes to develop Hot Wells as a modern destination site around a hotel and spa resort with a first-class restaurant that plays on its history. 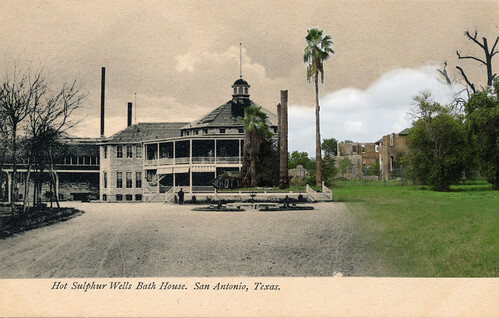 In 1892, workers discovered a hot sulfur artesian spring on the grounds of what was then called the San Antonio Lunatic Asylum far on San Antonio’s South Side. 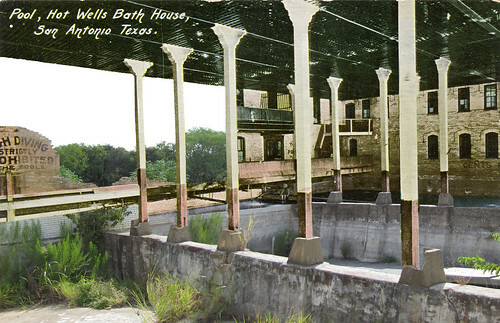 A year later, entrepreneur McClellan Shacklett leased the property to build a “first-class bath house” on large site along the San Antonio River, “a pretty building embowered by trees.” The Hot Wells Hotel was born. It was an era of hot water spas that promised the health benefits of foul-smelling mineral waters as aid to those who suffered “rheumatism, kidney, liver and skin diseases and blood poisoning.” Guests came, partook of the waters and stayed to enjoy the luxuries of the resort and its park-like grounds. A fire destroyed the resort on December 12, 1894. Shacklett tried to rebuild but lost his financial backers four years later. Otto Koehler, a German immigrant who had opened what became the Pearl Brewery, bought the property in 1900. Koehler developed the resort, adding a natatorium with three pools kept filled with hot water. He added a electricity plant to power the resort. In 1901, he moved an ostrich farm to Hot Wells, providing guest with the odd entertainment of ostrich races. Hot Wells became internationally known as a health resort and spa, compared favorably to world famous spas at Hot Wells, Arkansas, and Carlsbad, Germany. Streetcars ran to Hot Wells for a nickel. The days and nights brightened with social events – concerts, domino parties, swimming, lectures – that drew hundreds of visitors. The 1904 International Fair and Exhibition at nearby Riverside Park drew even more guests. In 1906, the Cincinnati Reds held training camp at Hot Wells. In 1911, Star Film Studios opened on the grounds of the resort. “The Fall of the Alamo,” one of the first movies made about the famous battle, was filmed there. Movie and stage luminaries, such as Sarah Bernhardt, Rudolph Valentino, Douglas Fairbanks, Tom Mix and Cecil B. DeMile stayed there. Theodore Roosevelt was a guest, as was Mexican President Porfirio Diaz. Gambling also prospered at Hot Wells. Guests could bet on the ostrich races, and gambling rooms were set up on the first floor of the hotel and in the bathhouse. A fulltime bookie set up office at the resort for more adventurous gamblers. The coming of Prohibition in 1918 and the ruinous Great Depression 11 years later spelled an end to the carefree days of Hot Wells. The popularity of water cures waned. In 1923, the resort was sold to a Christian Scientist group to be used as a school, which burned down two years later. There followed a decline as Hot Wells transformed into a tourist camp, then a trailer park and a bar and grill. By the 1970s, only a few permanent residents remained in the trailers and the old bathhouse fell into ruins. Nearby residents still dropped by occasionally to soak in the hot springs. An archeological investigation in 1984 by the Institute for Archaeological Research at the University of Texas at San Antonio found all that remained of Hot Wells were remains of the 1901 hotel building, foundation stones of a small adjacent building and the ruins of the bathhouse. Which brings us back to Lifshutz dream of returning Hot Wells to its glory. It will be a resort, he says, but one with a difference. Lifshutz sees the Hot Wells renaissance as a combination a restaurant of fine cuisine, elegant cabins as – the big twist - an area for high-end RV travelers. Not your usual array of recreational vehicles but those of a lifestyle that has emerged from affluent people travel the country in lavish motor homes to luxury parks near Sedona, Ariz. And Newport Beach, Calif. It is, Lifshutz says, a community of caravansary. “This is a demographic of significant disposable wealth that seek out cultural amenities where they travel,” he said. Lifshutz is keenly aware that Hot Wells has been the subject of at least two renewal projects that never got beyond the planning stages. The goal, Lishutz said, is to make the renewed Hot Wells something very San Antonio, the kind of special spa experience that goes with the unique nature of the city. Then and now photos of Hot Wells by Andrew Delgado. To see more San Antonio then and now photos, click here. For a behind the scenes glimpse of the NOWCastSA team at work, check out the videos taken by Charlotte-Anne Lucas on the ground at Hot Wells. Our apologies! Our website is experiencing technical difficulties (learn more at http://bit.ly/1QWKqfp) This story was published Sept. 14, 2010. Where is the date on this writeup?